With the opening of Maïs, tacos are back in the spotlight. Specifically non-standard, expensive tacos. Marie-Claude Lortie wrote about it last Friday, Sarah Musgrave wrote about it on the same day, and Joanna Fox beat them both to the punch when she wrote it up in Cult Montreal on the 16th. If you go searching you can probably find others like this, this, this, this or this. Now I’ve known Nick Hodge, owner/chef of Kitchenette and Icehouse for something like 2,500 days now, and while I wouldn’t quite go so far as to call him my BFF, he isn’t one of those people who crosses to the other side of the street when they see me. As far a I can tell he is the person completely, thoroughly and 100% responsible for bringing the concept of non-standard, expensive tacos to Montreal. While I adore his cooking, I’m never a big fan of waiting in line for anything, so once his restaurant Icehouse got popular I kind stopped going (which was unfortunate, as his food is delicious). After he opened Icehouse, Grumman 78 set up shop, and then we were off to the races. On Wednesday night I decided to see how a bunch of different tacos stacked up against each other. 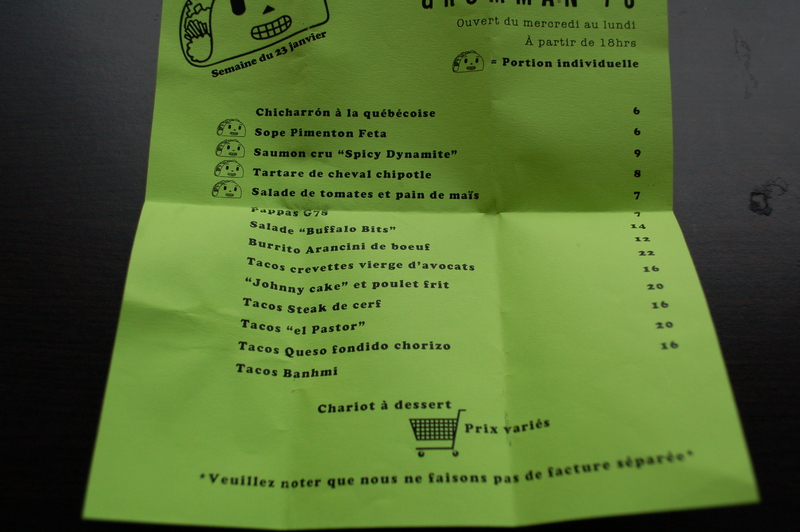 So I complied a list of 16 Montreal restaurants that served tacos, found a friend with a car and an appetite and out we went. The rules were simple. One restaurant, one taco each. 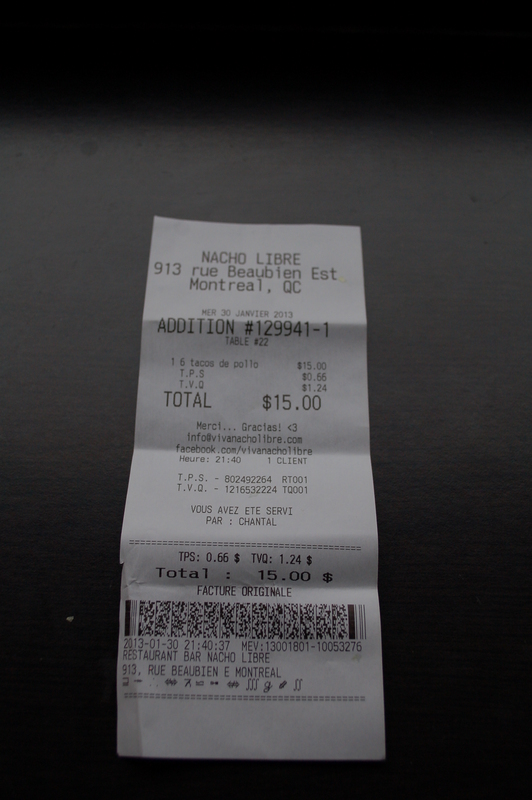 Off we went on The First First Annual Montreal Taco Tour®™. By the end of the night we had managed to consume six each. So the job isn’t quite finished, so at some point we are going to have to do The Second First Annual Montreal Taco Tour®™. 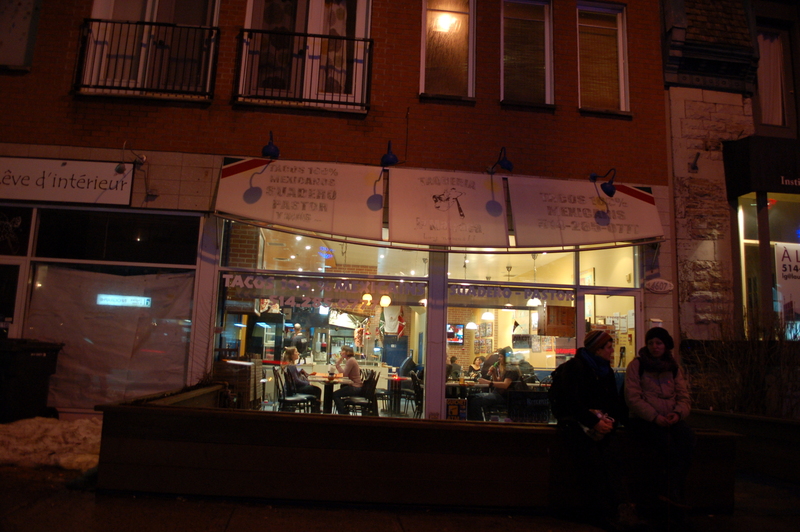 First stop was Taqueria Matraca, (4607 Saint Denis). We each ordered a Suadero Taco (basically a beef taco, although in this case it is a very specific cut of meat that is then marinated and grilled). 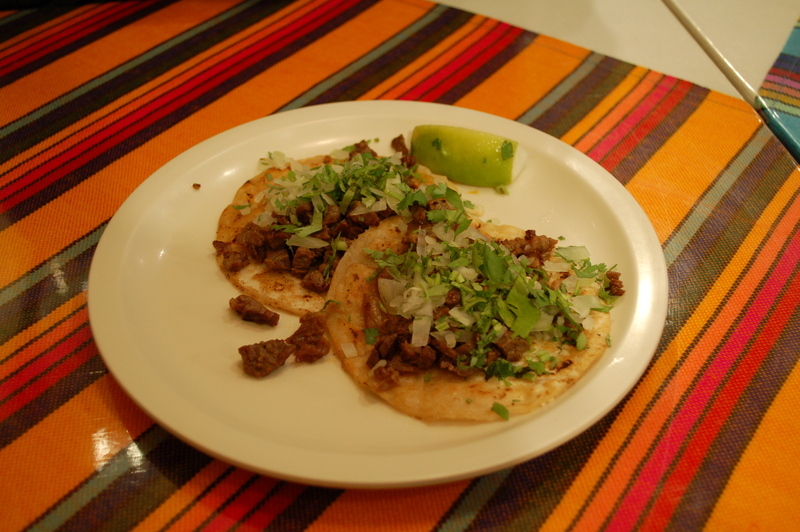 Taqueria Matraca offers five other types of tacos and a bunch of other items as well. At $2.59 each (including tax) they were a very tasty bargain and a great way to start the night. They discount them by 12.5% if you buy three. 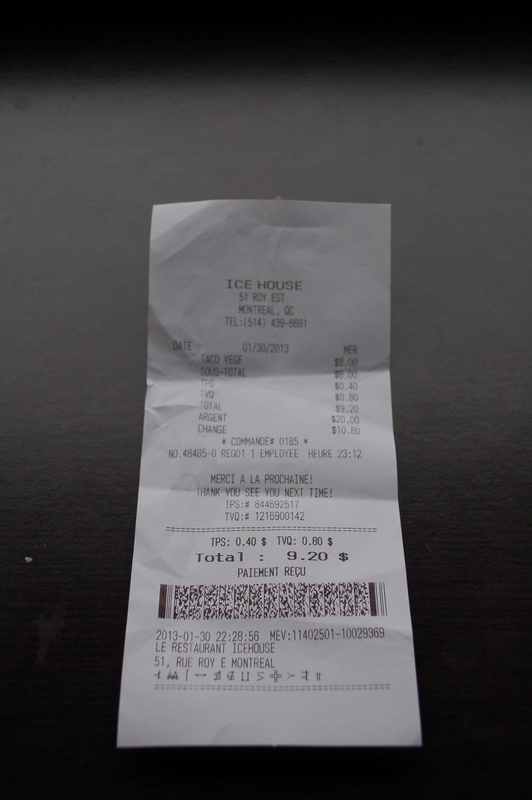 (For the record, the bill was issued at 19h08:13). 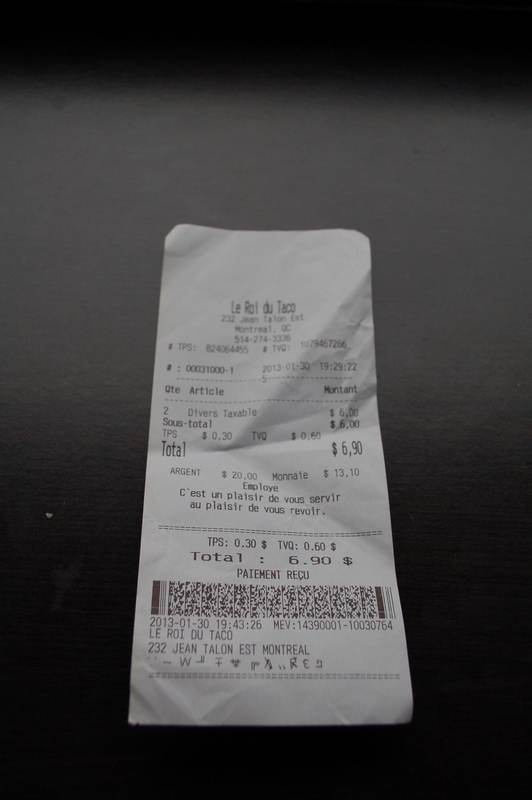 The second stop was Le Roi du Taco (232 Jean Talon Est). We each ordered a taco al pastor. Basically a ground pork taco. (Sorry, I forgot to take a picture). 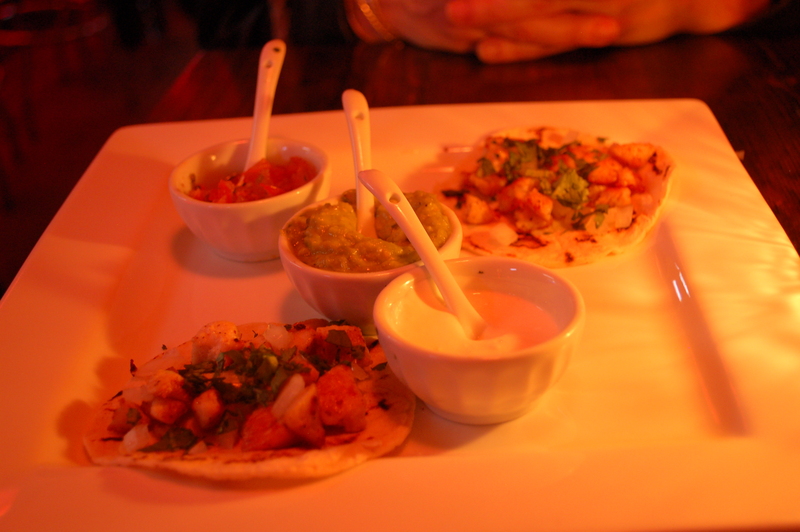 They were extremely tasty, and the salsas that came with them were scrumptious. As I forgot that I had my camera, and they don’t have a website, you gotta take my word for it when I say they offer a bunch of different ones and they are cheaper if you don’t buy them individually. At $3.45 (including tax), they weren’t quite the bargain that they were at Taqueria Matraca, but their size was larger and in fact they were even tastier. 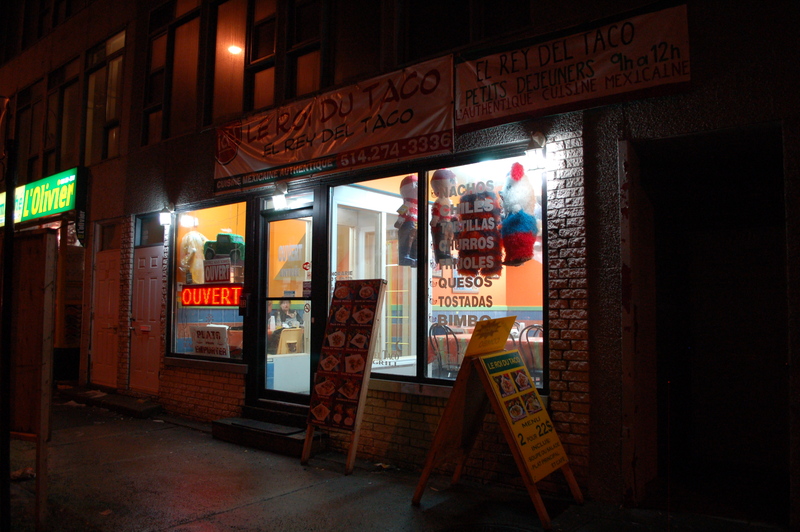 At the end of the night, my dining companion (and chauffeur) still said that Le Roi du Taco was the best. (The bill was issued at 19h43:26). 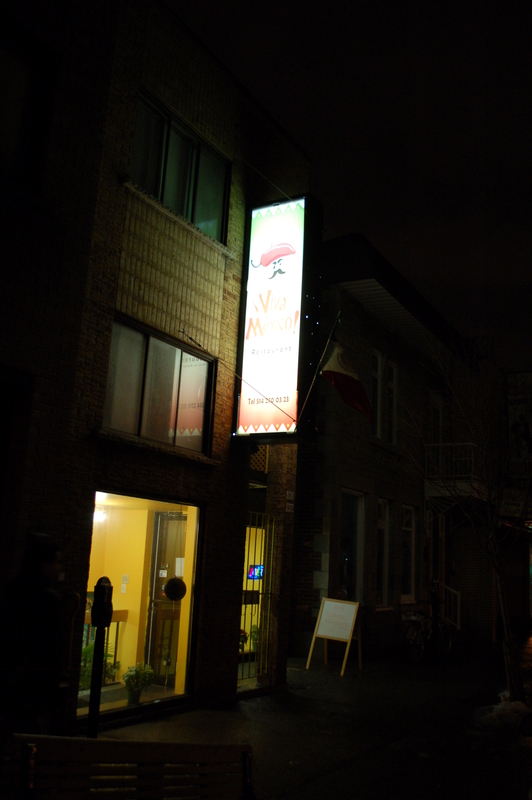 Our third stop was Viva Mexico (7450 Saint Hubert). By far and away, the most charming and gracious place we went to. The woman who served us actually inquired as to how and why we were subjecting ourselves to something like The First First Annual Montreal Taco Tour®™. We ordered, and ate a chicken taco each. 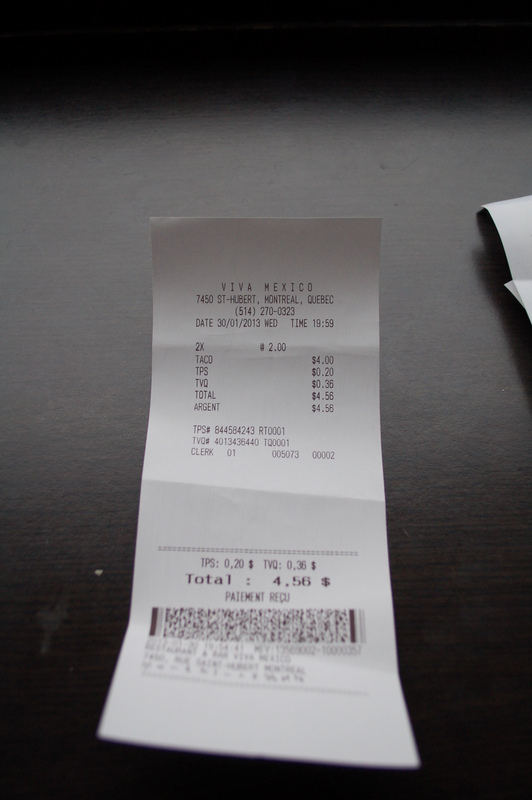 They were very nice, made better by the service, it was unfair to have them after the Le Roi du Taco. Viva Mexico would be much better received not as part of a tour but by eating there as a normal person would and ordering a full meal. 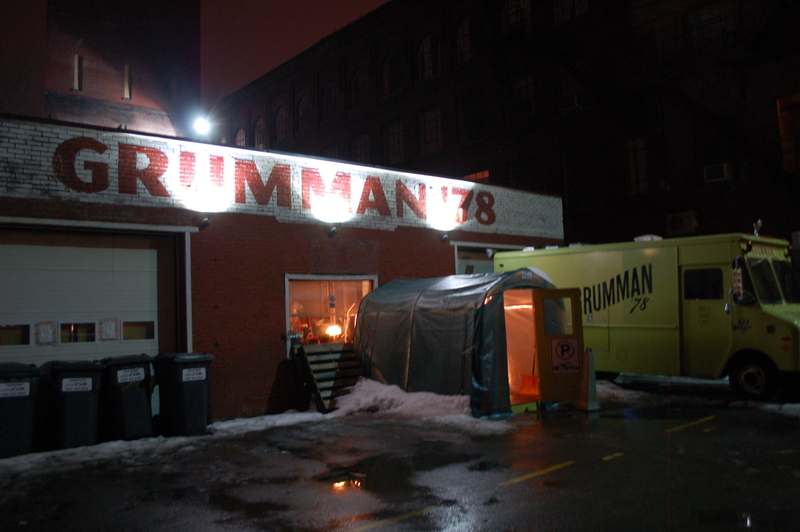 We decided to cross the mountain and get away from anything that could even approach being called authentic and showed up at Grumman 78 (630 de Courcelle). Gaelle, Marc and Hilary are pushing hard to change some antiquated laws here in Montreal and in the interim, after an aborted attempt at running a restaurant at the Faubourg, have opened their garage and prep kitchen as a restaurant. When we got there things were hopping, despite the Canadiens getting their patooties handed to them on a platter. For what it is worth, every restaurant we went to had at least one TV, and most had multiple TVs. First glitch in the evening. When we explained what the rules of The First First Annual Montreal Taco Tour®™ were we were told in no uncertain terms that it was absolutely and unconditionally impossible. There were four tacos on a plate, and we had to take all four or none at all. So we bit the bullet. Our server suggested the Johnny Cakes with Fried Chicken. The second glitch in the evening occurred when after being served I realized it would have been a much better idea if we had ordered for ourselves. 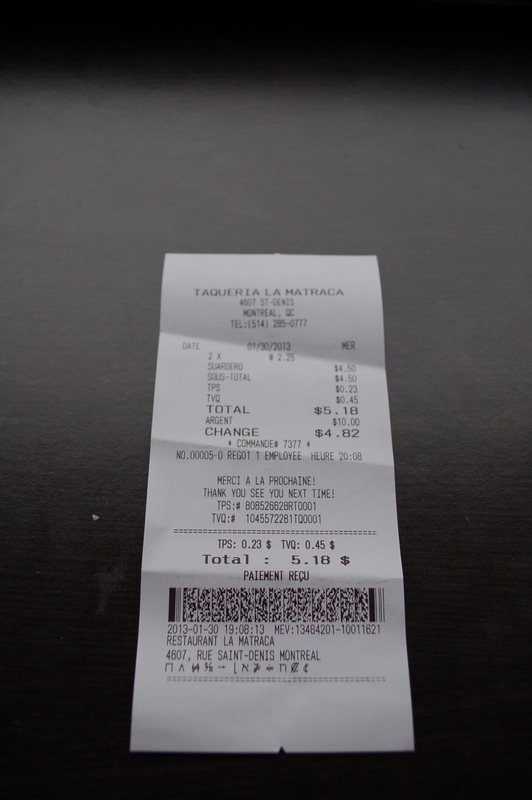 Yup, that’s right, $4.60 (tax included) per taco, and there is no discount for ordering more… (The bill was issued at 20h58:23). More than double the price of the cheapest tacos we had eaten up to that point, and 33% more expensive than the next most expensive taco. No matter how you cut it, they weren’t 33% better, not even close to being double the fun. If I go again, and that’s a mighty big “if.” I think I would be much more inclined to try the deer tacos. Although I have no idea what a taco “el pastor” [sic] is, and if were to order a Bánh mì, I somehow think it would be better on a fresh baguette than on a tortilla. No matter how fresh the tortilla was. And this is where the rails fell off the cart. We got to Maïs around 21h15. 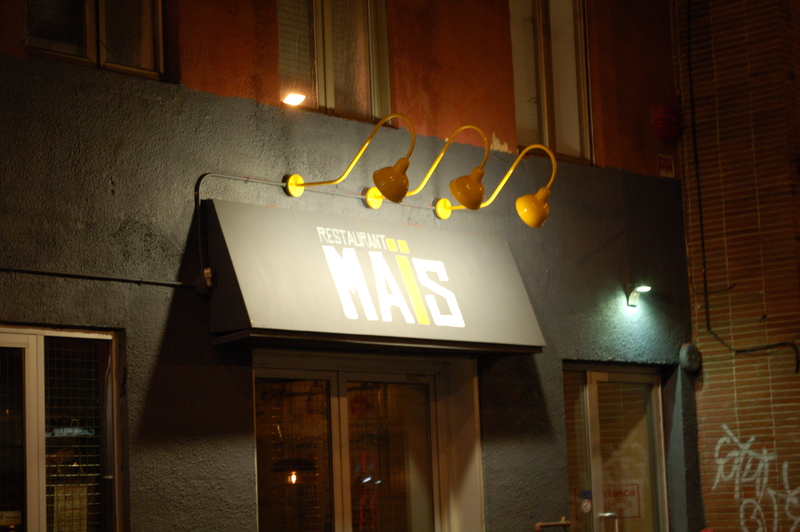 Initially on the way back from Saint Henri, we had tried to stop at two other places, but one was closed for the night, and the other one looked like it was permanently closed, so we continued up Saint Laurent until we got to Maïs. Parking was a relatively simple affair, and then after I took the picture, we walked in. There was no one at the door, so we took two seats at the bar. There was a menu, and so after the fiasco of letting the bartender order for us at Grumman 78 we settled on a mushroom taco. Just as we were about to order, this guy comes up to us and says “you can’t sit here!” And proceeds to lecture us that there is a waiting list and “could we wait by the front door” not phrased as a question. We say “ok.” Get out of our seats and move back to the front of the restaurant while Mr. Most-welcoming-with-open-arms explains things to the people who took our seats. While waiting we notice that there is another couple who apparently has been chastised as well and that (thankfully) there are two open tables. Mr. Incredibly-suave-smooth-and-diplomatic then returns and proceeds to tell us that there is a “30 to 40 minute wait.” The couple behind us leaves, and so do we. I think this sums up, rather succinctly, what my problem with non-standard, expensive tacos in restaurants is. They initially get a buzz, become very crowded, the wait staff has (quite possibly) not exactly been Cordon Bleu trained – heck (maybe) not even ITHQ trained. As a consequence, they believe that they are kings of the hill, since their restaurant is jam packed, and aren’t as polite as I would hope. For the most part I’m a better to good cook, and I don’t think I have ever been served anything at a restaurant here in Montreal that I could not make as well myself. I tend to eat out because of a combination of lack of time, difficulty in sourcing ingredients, variety and a congenital allergy to washing dishes. I am quite fond of telling anyone who will listen to me, that in a restaurant good food will not make up for bad service, however good service will (and most often does) make up for bad food. While there is a chance I might make it back to Grumman 78, albeit a small one. There is no chance whatsoever that I will ever go back to Maïs. And depending on things I might extend my boycott to its sister restaurants; Magpie and Sardine. Which is unfortunate, but thankfully there are many more restaurants in Montreal still left to try. Thankfully as well, we didn’t throw in the towel there either. While it wasn’t looking good, after a promising start, things seemed to be heading downhill rather fast, we decided that we in fact were still hungry. Thank heaven for Nacho Libre! 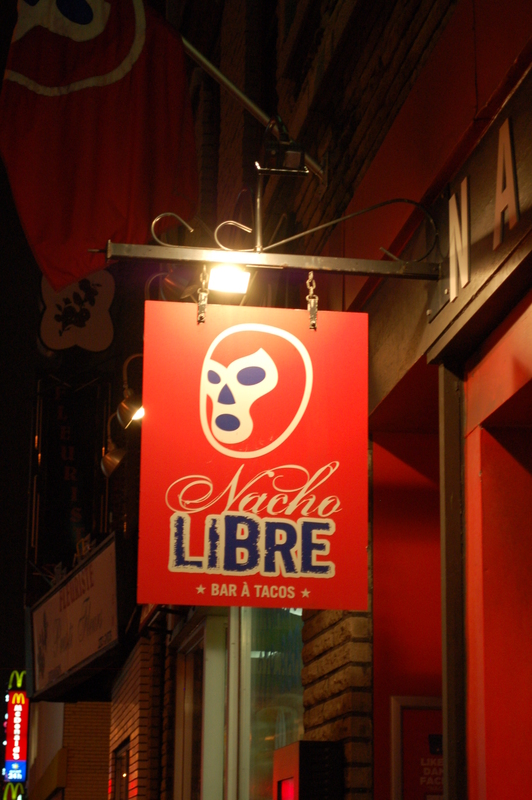 Or maybe I should say “¡Gracias a Dios!” Specifically, Anthoni, Simon and Chantal at Nacho Libre (913 Beaubien Est). Let me back track slightly, we walk in the door, and I had a vague idea of what we might be getting into. However, my dining companion (and chauffeur) did not. After helping her pick her jaw up off the floor, we proceeded to sit in the swing section of the restaurant, which was located in between the bar and the wall of larger than life posters of Lucha Libre luchadores. 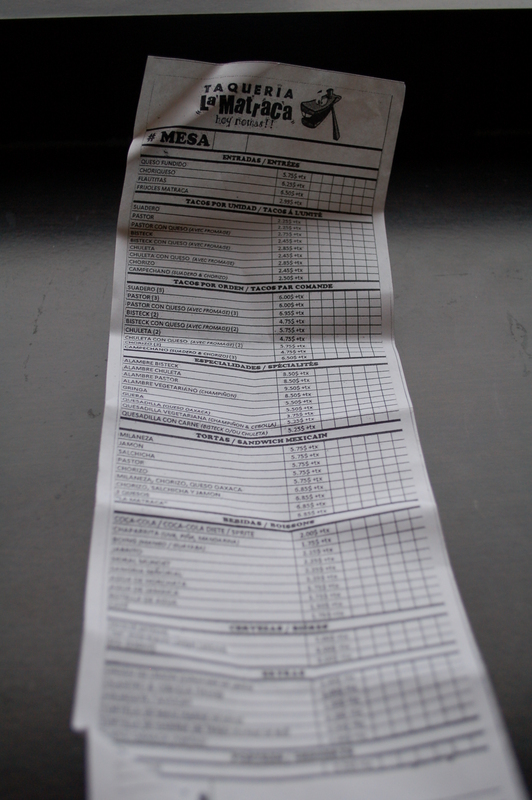 A waiter came over and asked what we wanted to order, we explained the situation. He said “no, we wont’ do that.” Now that I had experience in a similar situation, I asked to talk to the manager. The waiter went over to talk to someone, came back and said the answer was still “no.” I repeated my request to talk to the manager, and the waiter went and asked the guy to get up from his seat. He came over, and I explained our situation. While I was explaining it, I realized we were discussing a really silly point. They offer plates of 6 and 12 tacos. By this point we had eaten four tacos and weren’t in any way shape or form wanting to eat three tacos each. However, I also realized we weren’t talking about a gazillion dollars, from our perspective we were just trying not to waste food uselessly. Anthoni listened, initially said “no.” But then I said “how about you charge us for a plate of six, but just serve us two?” After a pause he finally said “ok.” It turns out that Anthoni is the owner. Thanks again Anthoni. As part of the discussion everyone had introduced themselves to each other, and after a bit Simon came over, introduced himself as the manager and asked if I was the same Zeke that had run Zeke’s Gallery and the Zeke’s Gallery Blog. We had been outed! While waiting for our tacos, I continued to giggle under my breath about the decor in Nacho Libre. It had more TVs than all the other restaurants we had been to, combined. Beyond the larger than life luchadore posters and the swings masquerading as chairs, they also would play bits off classic rock songs while commercials played during the broadcast of the hockey game. It was kind of like the rec room in the basement you always wanted when you were 14 years-old. If you happened to have been the 14 year-old offspring of two Quebecois ex-pats living in Mexico City in the 1970s. That, or a designer who drank too much Tequila one night while in a loge at the Bell Centre. I write this with the utmost fondness. Here in Quebec there is a term, quétaine that can either be used derisively, or complimentary. Similar to the word “bad” in English. In all my years I have never, ever seen a place as quétaine as Nacho Libre. To quote Douglas MacArthur: I will return and I will bring friends. Once I get real popular, I will bring lots of friends. The tacos themselves were good. Not the best, but not the worst either. On par with those from Viva Mexico. But while Nacho Libre, calls itself a bar à tacos, the emphasis is clearly on the first word. Initially, when we asked for the bill, Chantal, our waitress, tried to tell us that we had been comped and that the tacos were on the house. As I said at the beginning “I’ve known Nick Hodge, owner/chef of Icehouse (51 Roy) for something like 2,500 days now, and while I wouldn’t quite go so far as to call him my BFF, he isn’t one of those people who crosses to the other side of the street when they see me.” As I consider him to be the person most responsible for non-standard, expensive tacos, it only seemed appropriate to end the night at Icehouse. Good things happen to those who wait. Not only were we able to get our Mushroom tacos, but they were ginormous, better than delicious, tasty and pretty much as over the top as my description. While my dining companion (and chauffeur) still thought that the best tacos were from Le Roi du Taco, I respectfully disagreed and crowned Icehouse the king of The First First Annual Montreal Taco Tour®™. I’ve written to Nick in order to get the complete list of ingredients in his Potobello Mushroom Tacos, and as soon as I get a response, I will update this article. From what I can remember, there were Portobello Mushrooms (a bunch) fried and breaded onions, lettuce and some type of dressing. The menu is written on a blackboard, and I wasn’t exactly the best note taker. While normally I’m not a big fan of being served on paper plates and plastic cafeteria trays, in this case it was a good thing, as the tacos were over stuffed and I was not only able to catch everything that fell out on the tray. But then because it was on the tray (and not on the floor, my lap or somewhere worse) I was able to use a fork – the horror! The horror!! The Horror!!! – in order to eat it all. Nick, offered to comp us, again! But we prevailed, again! 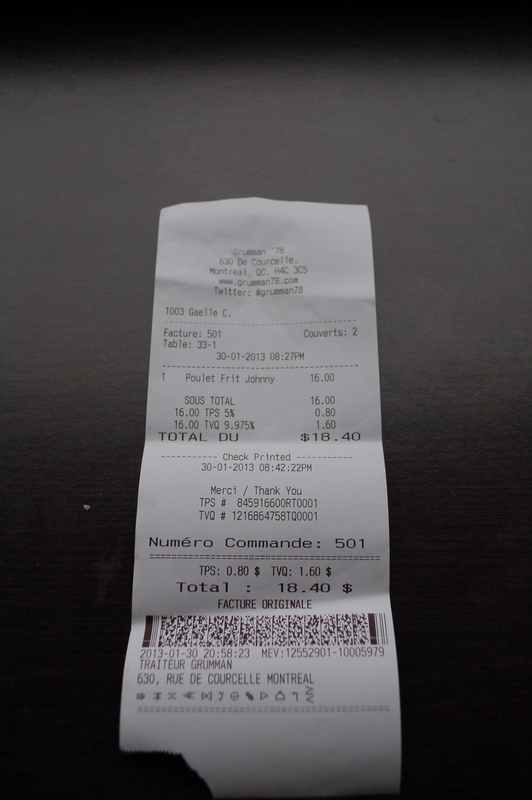 At $4.60 per taco (the bill arrived at 22h28:56) they are the exact same price as those at Grumman 78. 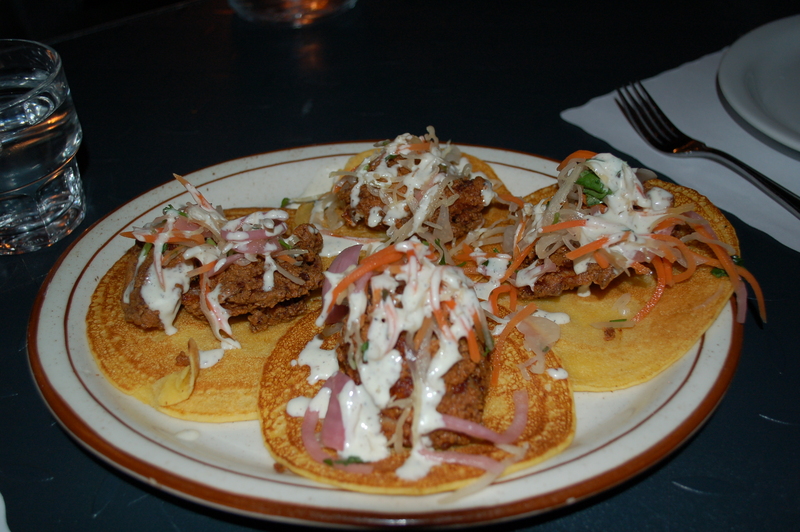 Unlike those at Grumman 78 the tacos at Icehouse are 1,000 times better and contain about twice as much food. I’d kind of sum it up, by saying if I was broke and hungry Taqueria Matraca and/or Le Roi du Taco would do fine. If I wanted to get something delicious that happened to be in a taco form, I’d go to Icehouse. And if I wanted to have a great time while watching the WWE and then happened to be hungry I’d go to Nacho Libre. It’s a good thing I am not around the western edge of Saint Henri all that often, and while I do get up to Mile End, there are a plethora of good places with great service if I happen to get hungry. It’s unfortunate, but Viva Mexico kind of falls through the cracks. 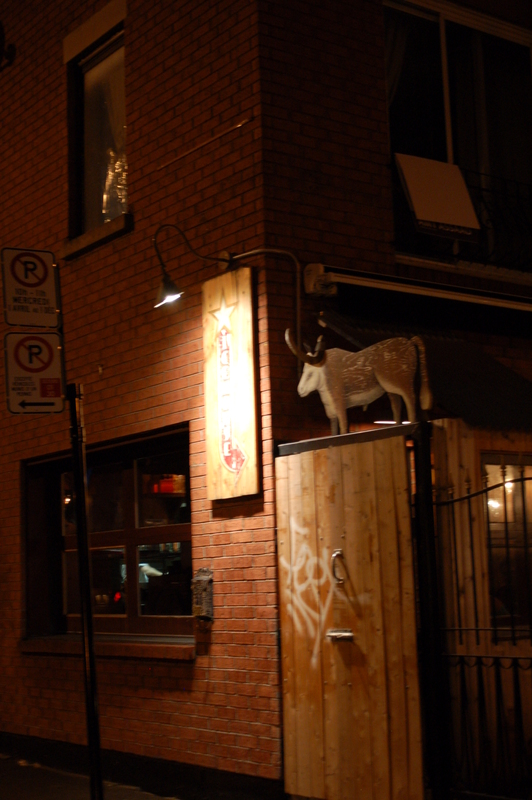 They serve good food, had probably the best service of all the places we ate at, but I get to Saint Hubert even less than I get to Western Saint Henri. I’m a Matraca man, myself. Glad to see they’re getting props. The one up on St. Hubert has always intrigued me. Now that you’ve written it up here, I’m going to go. At some point. When, you know, I’m up on St. Hubert. I think it would be best to go to Viva Mexico during the day, and with someone who spoke Spanish. 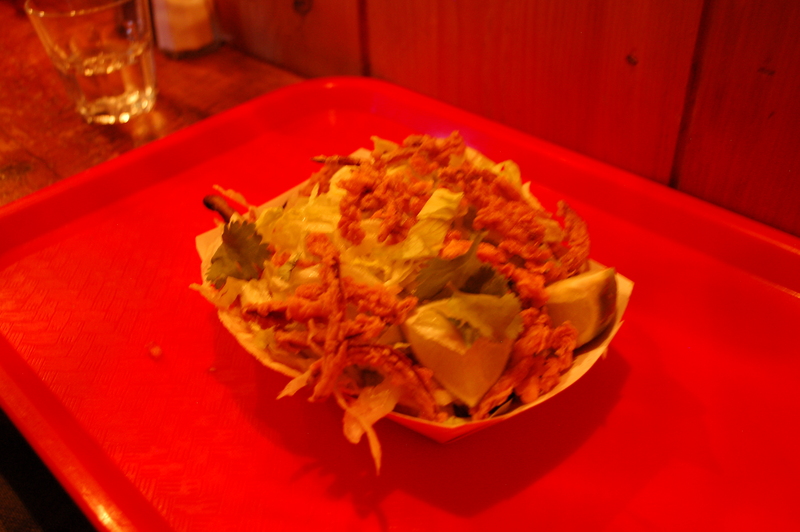 I also want to try Tex-Mex on Saint Germain. From the picture on Google Street View it looks like it could be a pretty good place. Now this is a tour! Thanks again for dropping by, Zeke! Thanks again for the kind and honest review of our dear Nacho Libre. Looking forward to your visit. Cheers! Zeke, I am glad to see that you are abiding by a protocol I would like to see all food bloggers follow, which is to not only identify when the meal had been comped, but also that the action does not bias your opinion.